Brightpearl will be your "master product list" so a product record is required for every product you sell whether it is available on all your sales channels or only some of them. This allows Brightpearl to be your central inventory and order management system; product details will need to be managed on both Brightpearl and ekmPowershop. There is no need to manually connect products. The integration automatically works by matching SKUs across ekmPowershop and Brightpearl. As long as your products exist in both Brightpearl and ekmPowershop and have the same SKU Brightpearl will managed the inventory levels and allocate items to downloaded orders. ekmPowershop does not provide a field to record an SKU by default, you will need to install the Product Attributes feature. Once this installed you will find the Product Code field avalable within product records where you should record the SKU. When you need to add new items to your inventory you will need to manually create products records in both Brightpearl and ekmPowershop. They must be added in both systems with the same SKU. As long as they have the same SKU, inventory updates and order downloads work fine. There is no need to worry about linking items manually. Both Brightpearl and ekmPowershop support products with variants, such as size or color. 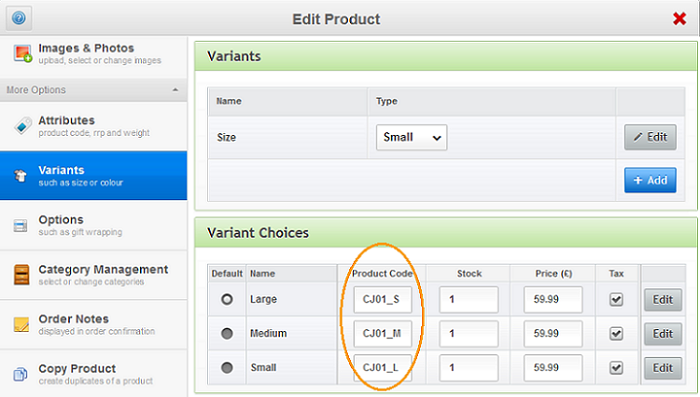 Each variant choice in ekmPowershop will need a unique SKU and each corresponding variant in Brightpearl will need the same SKU. ekmPowershop does not support bundles, or kits, but you can create a simple product which is a combination of items. This can be connected to a Brightpearl bundle. The bundle will need to be created in Brightpearl and assigned the same SKU as the simple product in ekmPowershop. Product details are not synchronized between Brightpearl and ekmPowershop so changes to product details need to be made on both systems. If a product SKU is changed on either ekmPowershop or Brightpearl so that they no longer match the connection will be lost. Inventory availability on ekmpowershop will no longer be updated from Brightpearl and products will not be added and allocated to downloaded orders. If a product is deleted in ekmPowershop or in Brightpearl the connection is broken. If a new product is used in replacement, they can be linked SKU-to-SKU as normal. Products will be disconnected as soon as the SKUs do not match. ekmpowershop allows you to offer your customers options with their purchase, such as engraving or gift wrapping. Any additional options, with or without a charge, will be downloaded into Brightpearl on each order, and will show on the order line only. Category details are not synchronized between Brightpearl and ekmPowershop. This data varies greatly across all sales channels, each one providing different options and structures to give you the best opportunity to get your product to customers. This deserves the time to be managed directly in ekmpowershop and cannot be driven from a hub system, like Brightpearl. Item availability is managed by the on-hand inventory level of the Brightpearl product, for the warehouse(s) that is assigned to that ekmpowershop account in Brightpearl. The inventory level is synchronized only when the level changes. Prices are not managed by Brightpearl. Prices need to be updated in ekmPowershop and separately in Brightpearl.